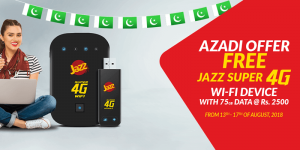 In spirit for celebrating Independence day, Jazz has introduced an offer called Jazz MBB Azadi Offer. 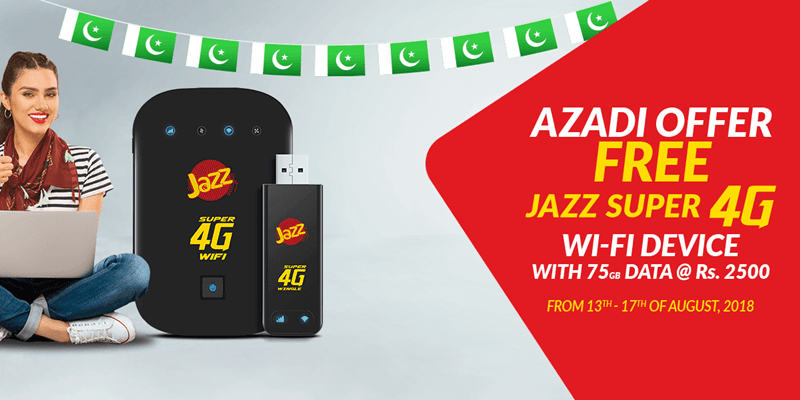 With this offer, All Jazz MBB new sale customers can get FREE Jazz MBB Device on BVS activation of 75GB in just Rs. 2500/- (monthly bundle) from August 13th to August 17th. Let us know in the comments section below if you found Jazz Azadi Offer 2018 | Jazz MBB Azadi package, helpful and interesting. You can also reach us at info@cells.pk for queries, suggestions, feedback or even if you want us to cover any topic of your choice – feel free to write to us. You can also follow us on twitter @CellsPK and Facebook @Cells.pk Stay tuned for more interesting News, Reviews and Updates coming your way.